The Belarusian government prides itself on having one of the lowest unemployment rates in the world. But the official statistics do not reflect the realities on the ground. The actual number of unemployed people is much higher than the official 0.6 per cent, and social support for the unemployed is almost nonexistent. Moreover, thousands of people have to work either in the ‘shadow sector’ or abroad. Recently, the authorities announced a new state program to foster employment. Ironically, instead of lowering unemployment its goal is to increase it from the current 0.6% to 1.5% by the end of 2012. The authorities have allocated $27m to finance the program, which is almost two times less than in the previous year. The new program has drawn public attention to the issue of unemployment in Belarus. According to the National Statistics Committee, there were 28,200 unemployed in Belarus at the end of 2011. This is 0.6 per cent of the total number of the economically active population. It means that the unemployment rate fell by more than 14 per cent in 2011 compared with the 2001 – the year of the deepest economic crisis in Belarus. The Belarusian unemployment figure of less than 1 per cent looks fantastic compared to the unemployment rates in neighboring countries. For example, Poland is at around 10 per cent, Lithuania and Lithuania around 15 per cent and Ukraine more than 8 per cent. Not surprisingly, the authorities in Minsk try to present these numbers as a remarkable achievement of the so-called ‘Belarusian socio-economic model’. Indeed, if we trust the official unemployment statistics and compare it to the number of vacancies, we will have two job offers per each unemployed person across the country and six(!) job offers per unemployed person in Minsk. And here comes the tricky part of the story. According to the National Statistics Committee, the overall number of employees across all the sectors of the economy fired in 2011 was higher than the number of those who were hired during the year. A simple calculation reveals that only these people account for almost 1.5 per cent of the unemployment rate. And if we add those who were unemployed at the beginning of 2011 the number will further increase. Thus, it is obvious that the official unemployment data is incorrect. This statistics trick has a simple explanation. The National Statistics Committee counts as unemployed only those who register with employment agencies. Those who are actually unemployed but do not register with employment agencies are not included in the statistics. Because of this flawed methodology it is quite difficult to assess the real unemployment rate. The estimates vary from 5 per cent to above 10 per cent. Perhaps the most recent and reliable statistics were acquired during the 2009 census. It revealed that at least 6.1 per cent of the working age population were unemployed. And it is reasonable to assume that in the context of the economic troubles of 2011 this number has grown. Why do Belarusians Choose not to Register as Unemployed? The first reason not to register as unemployed is the extremely low level of unemployment benefits. According to the National Statistics Committee, in December 2011 the average payment was BYR102,300 (around $12) a month. This is nearly 15 per cent of the basic needs budget, which is the absolute minimum one needs for mere physical survival. And even for this minimum one has to go through numerous bureaucratic procedures such as collecting papers, signatures and stamps that consume a lot of time and patience. The second reason is that registered job seekers are obliged to participate in public works program. While people are looking for jobs they have to do public works to which their employment agencies send them. This can include, for example, seasonal agricultural works or street sweeping. And the pay there is very low. As a result, instead of relying on the help from the state many unemployed choose to search for jobs on their own. They often prefer to look for opportunities in the ‘shadow sector’ which is estimated at 45-60 per cent of Belarusian GDP or go to work abroad. This is particularly typical among the youth and qualified professionals. The problem of the labour market in Belarus is that working in the 'shadow sector' is very beneficial and helps avoid certain potential problems. For example, they are not affected by the draconian contracting system. Nearly all employees work on the basis of short-term contracts, which makes employees totally dependent on their employers. In the absence of properly functioning trade unions, the short-term contracts system often leads to violations of economic, social and even political rights of the workers. On the other hand, for the state a large number of freelancers and unregistered entrepreneurs and employees results in lost tax payments and a growing share of the shadow economy. From 2012 the authorities will use a new method to calculate the rate of unemployment. As a representative of the National Statistics Committee stated, the households-based approach of the International Labor Organization which was used occasionally at the end of the 1990s will be regularly applied ‘in order to get objective information about the labor market and unemployment rate in the country’. But she added that the statistics will be classified. The intention to hide the real unemployment rate from the public’s eye is, of course, abnormal for a 21-century society. It demonstrates the government’s desire to preserve the myth of low unemployment as a ‘sacred cow’ of state propaganda. However, even classified statistics will be better than no adequate statistics at all. At least a limited number of decision-makers will see the real picture. In 2011, Belarus lost more than a quarter of its cows. Prime Minister Mikhail Myasnikovich, revealed this sad fact a week ago. He was bluntly exposing his country's illusory economic successes at a meeting with his colleagues. One of the core myths of Lukashenka's regime is its ability to maintain a viable agricultural sector. The truth is that the agricultural sector in Belarus is highly inefficient and barely survives only thanks to gigantic state subsidies. The government has been trying to preserve the Soviet kolkhoz system of collective farming and at the same time to ensure national food security. But now, a top official in the regime has admitted that the government's Rural Revival Program implemented in recent years has been a huge failure. Despite Lukashenka's initiatives such as 'the revolution in pig farming', Belarusian agriculture currently needs not only huge subsidies but also new technologies and markets. 'Over the [last] year we have lost 381,000 cows, or 28.7 per cent of the total,' said Myasnikovich on 31 January 2012. Many of those cows were purchased from abroad which makes the loss particularly damaging. How could so many cows die? The main reason was simple: a poor diet. It took the Ministry of Agriculture several days to come up with some explanation for the lost cows. Yesterday the Deputy Minister Nadzieya Katkaviec announced that the cows had not 'died' but were culled to produce meat, as though this could justify the terrific scale of losses. Belarusian agriculture has been in dire straits for decades. Even huge funds assigned by the government to support agriculture do not compensate for the perverse logic of state plans with fixed output targets. As one expert, Kanstancin Skuratovich, notes on nmnby.eu, agriculture is an untrustworthy partner that threatens the whole Belarusian economy. The authorities like to skew the statistics to make bad things look better. Some years ago, the government set the task of producing 6m tons of grain. Already at that time the experts doubted the necessity of this increase, because it would force the farms to give up production of other cash crops. As a result, the output targets and corresponding production of grain have risen each year, while the production of other commodities has fallen. In 2011, official statistics claimed that Belarus was producing a stupendous 10m tons of grain. But experts were very skeptical about the accuracy of this figure. Agricultural production in Belarus reached its peak in 1990. Since then, the rural population has declined by more than a quarter, especially those of working age. Currently around 25 per cent of the Belarusian population lives in rural areas. This outflow reduced private production of vegetables, fruits, milk, and meat. At the same time, the urban population has increasingly renounced the old Soviet habit of producing some food for subsistence by working on their datchas. The urban dwellers no longer grow their own potatoes as they used to do in the past. In a country with the largest per capita consumption of potatoes in the world, decline in potato output is a serious problem. The negative results of agricultural support for grain are becoming more egregious. Last August, Alexander Lukashenka stated that the government would provide less subsidies to agriculture than in the past. But with more Russian subsidies, he could reconsider his decision. Lukashenka used to start each new campaign to revive agriculture with bombastic slogans with references to Soviet traditions. In the mid-2000s, he launched a campaign to build 'agricultural towns' throughout the country. While this involved urbanization of larger villages, it also kept agricultural wages at about 40 per cent below the national average wage. Focus on agricultural towns also left agricultural management reform untouched. In 2004, Lukashenka ordered the sale of all bankrupt collective farms to private or state firms. He argued that added investment would revive the farms. That resulted in the coercive handover of impoverished farms to firms that support them only to avoid punishment by the state. Even the National Bank of Belarus was ordered to manage its own kolkhoz. 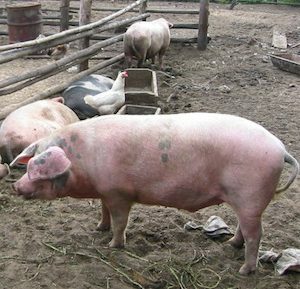 In 2009, Lukashenka publicly launched a 'revolution in pig farming' by establishing pig farms on par with the latest Danish and Dutch standards. Like most campaigns by the Belarusian regime, the undertaking ended in silent failure. Indeed, under Lukashenka, Belarus has lost 720,000 hectares of arable land – more than 10 per cent of the total available. Can Belarus Export Food to the EU? Prime Minister Myasnikovich recently reminded the government about the tasks set by the president to export $7bn worth of agricultural commodities by 2015. According to the Agriculture Ministry, that means that potato exports by 2015 should increase 14 times from the current level. However, the current acreage allotted to potato fields can produce only about 1m tons of market quality potatoes, just enough for the domestic market. In order to export, it needs more fields, and of course, more investment. The same equation applies to cattle breeding and dairy products. At 70kg per capita, meat production in Belarus has failed to return to the levels of the 1990s. That means there are few export opportunities. Export opportunities for dairy products are also limited; indeed, recent increases in dairy exports have constrained domestic supply. Of course, Belarus can also sell its rye and sugar abroad. But it has much more to import than export, like wheat, seafood, and vegetables. That means it can hardly use agricultural exports to boost the export performance of Belarus. Belarusian agriculture, if properly managed, can feed the country and export its surpluses. The climatic conditions are no worse than in Denmark or the Netherlands. The leaders of the then newly established Belarusian Soviet Republic in the 1920s aimed to make Belarus the world's major agricultural producer alongside Switzerland or Denmark. Stalin and his successors stifled this goal and murdered its proponents. But it still has merit today. One of the best ways to achieve this would be to open European markets to Belarusian products, including agricultural commodities. Most of them – 89 per cent – are currently exported to Russia. It could coincide with more European investment and technology transfers into Belarusian agriculture. At the moment Belarus has negligible investments in agriculture with two of the most successful projects being implemented (somewhat ironically) by Israel and Iran. Foreign investments and new technologies could seriously boost production. Reviving agriculture, in turn, would help relieve the national economy of and cure the negative trade balance.